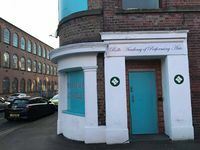 The Hackspace has a wide variety of tools available for members to use. The condition of tools in the space varies wildly but, generally speaking, most are well maintained. Interesting tools include the Laser cutter, Myford lathe, Welding equipment, Brother knitting equipment, CNC Mill etc. It can be hard to locate the specific tool you need, particularly hand tools. The Tools we have page is an incomplete list of our tools and their locations (please, please, please, put things back where they're supposed to go). Some of our tools require inductions before they can be used. The induction has been introduced either because the tool is dangerous or it requires specific skills to use. 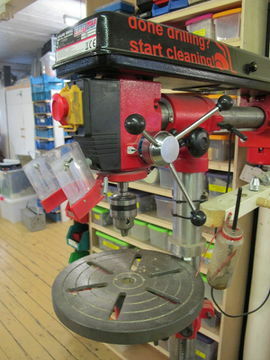 Inductions cost £20, normally last about an hour and will give a short introduction on how to operate the tool safely. On each wiki page you will find information on how to book an induction for that tool. With the exception of a few large tools, replacement consumables can be requested through the Tools Team. Note: It is important to remember teams are volunteer run and the Hackspace is not a service. If you need something urgently it is often better to bring your own consumables. For Tools with Wiki Pages, The responsible team is listed on the page. Broken tools happen, don't worry too much about it. Please don't just run away from the problem or leave the tool in an unsafe state; report it. Please also report any Maintenance that needs carrying out to the relevant tools team. Some of our tools have been obtained as a result of member donations or long term loans. Bare Definition: A pledge drive is a mechanism to assess the degree of interest in the purchase of a big ticket item for the Hackspace. A little local crowdfunding if you like. 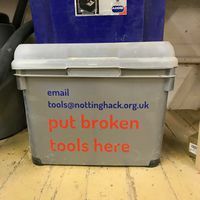 Basic form: Someone, or a small group, declares on the Google Group a desire to have an item - for example a power tool, or CNC machine - added to the Hackspace inventory, by offering a contribution to the cost. "Joe Soap - I'll pledge £10 to get a Super-Wazzo machine in the 'space". The initial posting then attracts other members to pledge in like manner, and in no time at all enough has been raised to be able to go and purchase the machine. Job Done. Of course, in practice it is not as simple as that. And there is more than one way to contribute to the drive, and the payment. There are two kinds of Drive - a Pledge Drive, where no money is handed over until enough pledges have been received to allow the purchase to go ahead and a Contribution Drive, where money is collected (via cash, or bank transfers) during the drive. Deciding early on in the Drive what kind it is is important. In the case of a Contribution Drive, there is a danger that if the drive stagnates, those who have actually contributed could get alienated and put off contributing in future Drives. On the other hand, a Pledge Drive, once its target has been reached needs either quick collection of the monies pledged or a 'bridging loan' from Hackspace funds (if available at the time) in order to complete the purchase. Who can contribute? Another difference between the two types of Drive is that a cash - collection drive is like rattling a charity-tin - anyone can contribute, non-members as well as members. This might be the way to get, say, another decent-sized heater for the 'space, where it's benefit on winter open hack nights can be felt by all. Should there be a time limit? Getting near to the target can induce a degree of apathy (applies to projects as well as drives), and there may come a time when 'external force' is needed - e.g. the Hackspace Board deciding to fund the last 15% from general funds. That this is a possibility should not, though, be used as a 'lever' by a partisan group to enforce a contribution from general funds. Perhaps, early on in the Drive, the Board should agree to make a contribution if necessary to bring the Drive to its conclusion - The amount and timing should be kept secret, or not decided, as default Drive should be that all of the money is collected. Often a wiki page is made for the pledge drive to record pledges and progress. Current pledge drives are listed in Category:Pledge Drives, past ones should be moved to Category:Pledge Drives (past). This page was last modified on 5 April 2019, at 06:49.